Hemp oil is simply the oil extracted from the hemp plant. This oil contains natural chemicals called cannabinoids that are very similar to chemicals that our own brain and body makes. One of the most known Cannabinoids is CBD. Though there are perhaps 100 or so more in the Hemp Plant, CBD is one of the most prevalent and most recognized to have incredible health benefits. These chemicals work in our body by acting on receptors that are present throughout our entire body, but with especially high concentration in our Brain and Nervous system, and our Immune System. ​The problem is. . . Most people are not making enough of these chemicals on their own. Environmental toxicity, poor nutrition, too little movement, and physical and emotional stress (fight or flight) are just a few of the things that we think cause the body to underproduce these incredibly important endocannabinoids. Our Bodies, minds and overall health are just under too much stress. By extracting hemp oil and taking it into the body in liquid form, these natural phytocannabinoids (from plants) are able to influence those same receptors that are present throughout the body. This means that the systems of the body are better regulated and controlled and our whole system can be in better homeostasis (balance). And better homeostasis means better health. People report that they use hemp oil for so many different reasons and symptoms because it works to influence so many different systems of the body. And this makes sense. When we bring in these Phytocannabinoids in Hemp oil, the Endocannabinoid System works more efficiently and all the other systems can function better too! 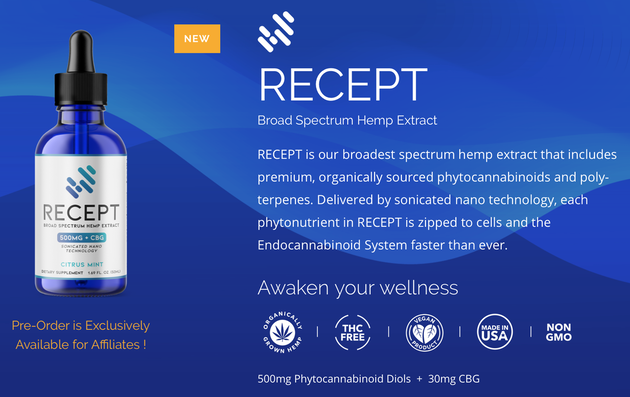 PrimeMyBody's newest Hemp Oil Extract, RECEPT is the best because. . .
- Is Broad Spectrum, meaning that it contains other phytocannabinoids and terpenes (aromatic compounds) which work synergistically with CBD in order to allow the body to best utilize the Hemp Oil.